When that alarm goes off, I don’t check my blood sugar to confirm. Not in every circumstance, at least. If I’m sitting at my kitchen table and the alarm goes off, I’ll open the app on my phone and look at my actual number, sometimes confirming Dexcom’s suggestion with a finger stick and my glucose meter. But if that “MEEEH MEEEH MEEEH” alarm goes off while I’m asleep, my level of due diligence takes a backseat to the urgency that sound brings about in me. I’ll reach over to the bedside table and have the juice box or glucose tabs … whatever is there and at the ready. Or if the alarm goes off while I’m driving, I’m not going to take the risk of pulling out my phone while I’m shuttling my daughter around. I’ll grab the glucose tabs from the center console and pop a few, pulling over as quickly as possible to check all the data sources. Bottom line? That “MEEEH MEEEH MEEEH” alarm goes off, I am everything other than “meh” about it. … even when the alarms aren’t mine. I can’t tell you how many times I have accidentally treated someone else’s low blood sugar, because the Share alarms for lows and my own alarms for lows sounded exactly the same. That means I’m sometimes treating low blood sugar alarms that aren’t meant for me. It wasn’t until I posted my review of the Dexcom G5 system that someone alerted me to the fact that I can update the sounds and alarms for the people I follow through the Share application. I did that right away. 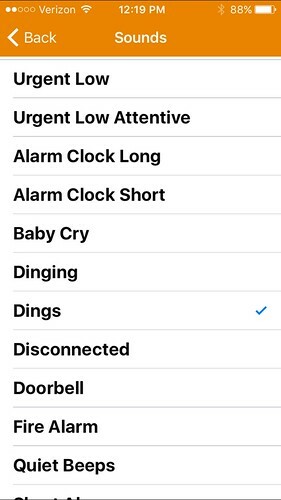 Which now means that the dings get all dinging when someone else is low, but my low alarms remain MEEEH x 3. Enjoy the Silence. Or Not So Much. Robot Arms. Spot Off. Dexcom SHARE with Bluetooth Thingy.